Eco-Friendly EPIC Legendary Cleaner was created with you in mind. EPIC Cleaning Products wanted a product that could handle the everyday grind of cleaning commercial/industrial properties. Inspired by jobs we do every day, this all in one cleaner is mild enough for residential and the environment. 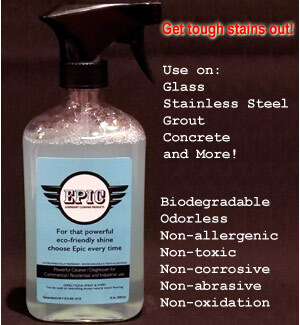 EPIC replaces all of the cleaners in your home – use it on glass, stainless steel, and even concrete. Strong enough to clean even the toughest stains. EPIC is made, bottled and sold in Michigan. A powerful yet gentle cleaner that is good for the environment, safe for all humans and pets, and actually works! EPIC is tiffany blue in color and has no fragrance. EPIC can be sprayed directly on any surface you wish to clean. The 16 ounce spray bottle has an 8-1 dilution ratio. When working on hard to remove grease spots or flooring, it is recommended that you add EPIC to hot water to increase the active ingredients. Activity is in accordance with Green Seal – Standard for Cleaning Products for Industrial Commercial and does not contain any chemicals that have carcinogens or that are known to cause reproductive toxicity. Furthermore, it does not require complex recycling and is not corrosive to skin or eyes. Disclaimer: Can be used on everything except natural wood flooring. The main advantages of this new product are that it is biodegradable and non-toxic. This formula is not abrasive and does not promote oxidation. Non-corrosive on surfaces and it allows for surface protection against corrosion. For that powerful eco-friendly shine, use EPIC Legendary Cleaner every time!